[6-13-2016]_ It's been over a year since the last update. I've been busy with real life, but I am still working on Quadrill 5. It may be almost 2020 by the time it's completed, but I am still working on it. I have finished: 'Mountain of Kogeta Wind', where the fourth SFlag is located, Oslo Island and the fifth SFlag located in a caved-in nightclub, several desert islands, including the Canado Oil Island, islands near the bottom extent of the world, the island of Canavaraal, the birthplace of civilization and a lot of conflicting and confusing stories about its significance, some of the lore explaining Canavaraal, the Hillside Tower of Xervah (named after the tower from Valkyrie Profile; the name Xervah seems to be unique to this tower as well), where the sixth SFlag is located. Next up to be completed is an old destroyed set of barracks where the seventh SFlag may or may not be based on storyline triggers, and then a factory near the southern edge of the world where the seventh SFlag will be if not located in the destroyed barracks. I've implemented some new features, such as cloaking, night vision, and enemy rangefinding, but the more impressive ones will be coming later. [6-3-2015]_ I have added the island of Mastania, home of the world's largest jungle (Ayers Jungle). In the jungle is a giant inverted pyramid made out of large blue stones. I have implemented the poisonous air mechanic which is similar to the heat mechanic (and hopefully, I've mentioned that earlier) except that it doesn't work when the player is motionless. There are flowers in the jungle which create this poisonous air. 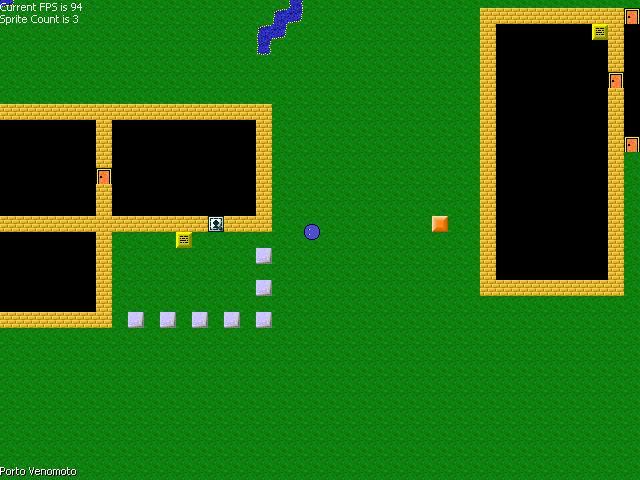 There are also monsters and items that I have implemented: the stamina spring allows greatly increased stamina for extended running, the jump boots (another Quadrill classic) allows the player to jump across single tile gaps, the flippers allows the player to move at normal speed through water, and x-ray vision, which reveals areas that are obscured by walls (excellent for finding hidden areas). I've started building a mountain (Mountain of Kogeta Wind) where the fourth SFlag will be kept. It involves a lot of block pushing and hole jumping. There are a few more things that I want to implement before completing this mountain, so no pictures of it yet. I've created desert islands: Oslo Island and the Canado Oil Island. The fifth SFlag will be in a rock structure in the desert that I need to build, as well. [5-19-2015]_ I have added: Kiyto Caverns (named Lovestone Caverns), which bring back the classic Quadrill colorgates that have been in every Quadrill installment; yes, all the way back to Beta Quadrill 1 for VB6 with only four SFlags and the 'mock' Quadrill 0. This time, the gate system is different in that it can be toggled by either pressing the button or hitting the wave reactor of the same color. 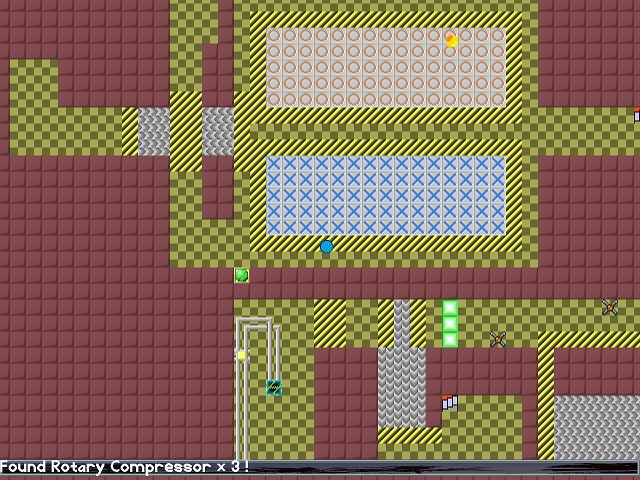 In the picture, you can see the green wave reactor which will raise and lower the green gates when shot. I have added the next island of Mastania and locals that speak in the local dialect. A basement, shown in the picture, features what I've probably been more excited about having for a while: magnetic field generators. The magnetic field generated will push any projectile that passes over it in a circle, similar to that of charged particles passive through a magnetic field. The magnetic fields going inwards are shown as the blue X, while the opposite-polarity magnetic field is the red O, and projectiles will pass as if they were giant electrons. As such, projectiles will travel in crazy paths after entering and exiting the magnetic field. I've also added underwater areas and the second boss guarding the second SFlag. [4-18-2015]_ The island-to-island network is expanding. I have added two islands: Eklemata and Kiyto (probably not finalized names). Eklemata is a city partially overrun by wild wolves. Other than that, there's nothing of note, other than these wolves are the first enemies with pathfinding AI. They're pretty dumb, however, and will conveniently forget to chase you once they've passed around a wall in front of them (unless you're nearby). I've added the volcano island of Kiyto, where there are mountains and an imposing crater lake. I've also added an enemy which functions similarly to the hard hat monsters from the Mega Man series. As such, I've named them hardhat; they're not terribly similar, yet they do hide in their hat to become invulnerable. The city of Reactor Harbor is pictured here. If you can figure out what type of reactor it is and where it's installed, you get a prize (in the game). [4-6-2015]_ I've expanded the island of Kalonia to include a natural gas processing facility, where the first SFlag is located. Other places that I've added include an area of the marsh that you can walk into and explore (there's nothing there yet, so there's no point) and I've also added a fen full of monsters (because I have to show love to traditional environmental biomes that you don't get to see much of in video games nowadays). At any rate, the natural gas facility has lasers in it which will do something that I have not implemented yet (the contenders are "guards will spawn" and the obvious "kill"). The lasers can be blocked by blocks so you can probably guess which of those aforementioned contenders I'm leaning closest to. There are also machines that shoot compressed air projectiles when you walk onto their horizontal or vertical. One can be seen firing in the picture right now. I've also added a boss that doesn't work correctly, but takes six hits to kill. It's not pictured because it doesn't work properly yet. 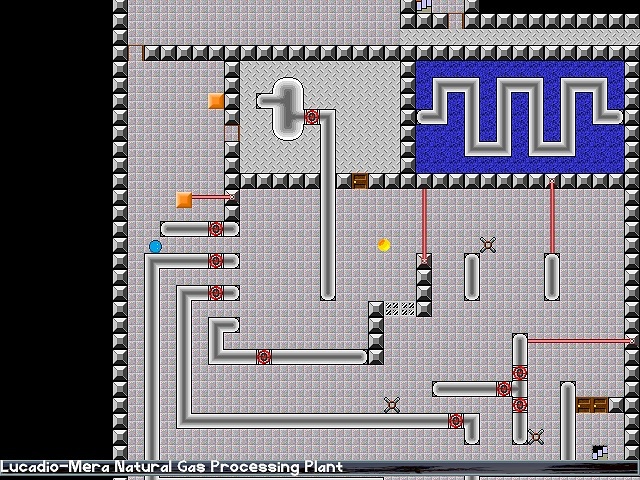 Also, if you ever find yourself wandering around the natural gas facility, you will notice that I actually modeled it off of (part of) an actual natural gas facility. The starting island has three cities to visit: one is a port town, one is a large city, and one is an extra city that doesn't serve any other purpose but to expand upon the Quadrill 5 lore. The port town will ship our hero to one of three other affiliated ports, but an important piece of ship equipment needs to be found (essentially, a "tutorial" dungeon, which can be bypassed by finding a hidden alternative). Bullets are now consumed and must be used carefully, since creating new bullets requires salvaging enemy drops. Accessories may be manufactured from item drops (such as a respirator which allows you to breathe longer underwater). Oh, you can also walk across shallow water rather than needing the raft. There will be no rafts in Quadrill 5, only modern nautical transportation means such as the aforementioned ship. Money can be used to buy equipment and other collectibles (admittedly, there's a very high number of these that serve no real purpose). Currently, the Quadrill 5 world consists of two islands: the first 'tutorial' island and the second 'wetlands' island. The game is going to be open world and ideally allow an observant player to travel to more beneficial areas first, but talking to townsfolk will generally guide the player to each location in its "proper" order. However, the game is currently linear since there are only two islands The darkness of the woods shown in the previous image are now smoothed out due to .NET and DirectX technology. The game runs at a somewhat forced maximum of 120 FPS (unrestricted framerate is over 400 FPS, which is quite an improvement over the framerate in the previous video; the lowest unrestricted framerate observed was just under 300 FPS). Of course, frame rate varies from computer to computer, but I have not observed any frame rate loss... yet! The game does run a bit slower than expected due to scaling the frame rate; I will hopefully improve this as time goes on. There are other additions, but I will hopefully mention them in future updates. 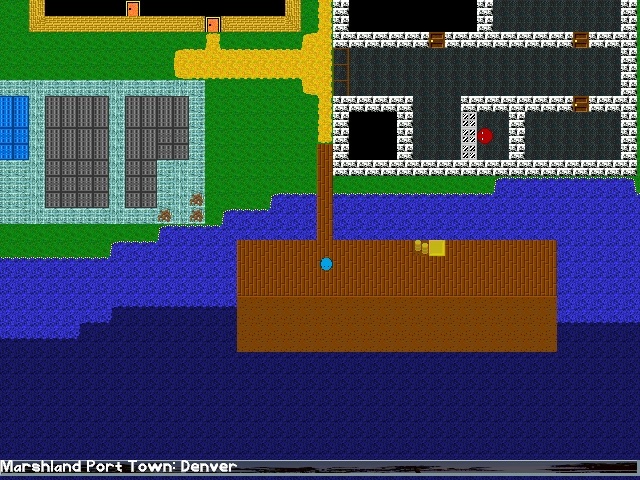 You can see in the screenshot the city of Denver is a port for the marshland. I wanted to take things from the world and put them into slightly differing contexts. There are a lot more plans that I have, but we'll have to wait and see how they turn out! [2-25-2013]_ As a bit of brainstorming, I've added this secret set of stairs to Initializa Forest in Quadrill 5. You're familiar with that 'Initializa' thing, right? 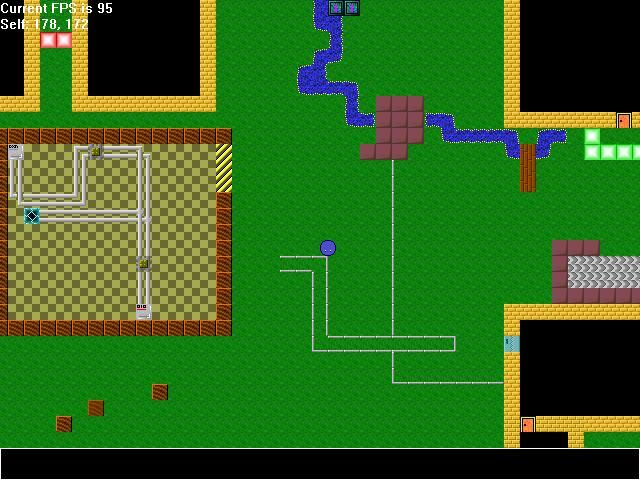 It's the first area of each Quadrill (with the exception of 2, because I wanted to mix things up for that one). Anyway, as you can see, I've updated the darkness rendering port by making some performance tweaks - so it now runs twice as fast (halved the speed) and gets me up to 94 FPS... I can probably do it much faster with 3D rendering, but I... think we'll just get the game working before I mess with that. Also, I probably should have uploaded some NPC pictures just so you can see them. [2-18-2013]_ You see the cars in the picture? I've implemented cars that will now drive around on the street and take turns randomly. Perhaps this will provide an illusion of having traffic in the city. Each tile that the car drives over gives it commands as to what it should be doing. Overall, it's about 30 tiles that I had to code in, between giving the car random values to keep track of and how each random value translates into a right-turn at a four-way intersection (three of them are off screen to the south), how to not turn off-road at a three-way intersection. I'm still impressed with my own skills at how I laid down all of the streets and just wrote the code to work correctly... well, I forgot to put an End If statement, if that counts. As a follow-up, I've begun making a popular pastime (one of a few) for Quadrill people. It's called Glove Fencing and is based off of the duel style of "Uncharted Waters 2: New Horizons" where you select possible attacks. Currently, all it does is show you some cards, but I'll eventually get it working. [1-14-2013]_ Well, I've implemented quite a few things since the last update - a single screenshot won't encapsulate all of the stuff that I did. Firstly, I've setup the first of many shops - the goal of the shops are to buy goods, sell goods, and you can trade with other shops to make money. Secondly, I've setup factories that can mass-produce the items that you need - if you have the right ingredients. Thirdly, as you can see in the picture, I've got the map hidden so that you can't see certain areas that you have not explored. Fourthly, I've made the camera blocks and medusa blocks from Quadrill 4 work again. They're a little more streamlined this time, so there'll probably be more of them. Fifthly, I've setup fire again. It operates a little differently, but it's essentially unchanged from the player's point of view (with exception of the new graphics). 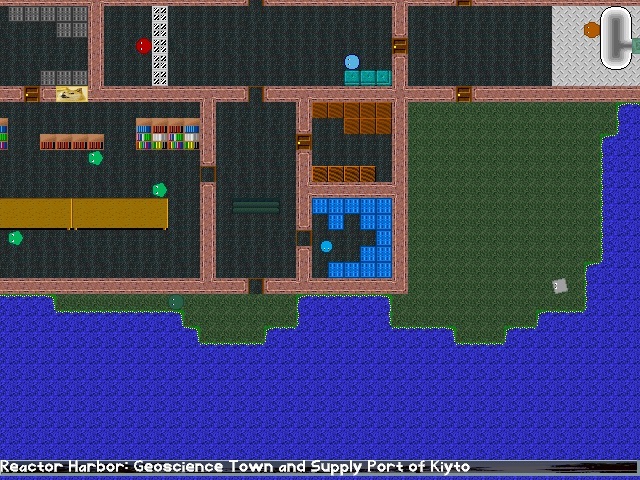 Sixthly, I've added NPCs - which, by the way, run the shops and the factories. Right now, I'm finishing up the maps - making more tiles so that the game looks nice. [12-7-2012]_ The new update - well, a stillshot doesn't really do it justice. It's an update to the shutter doors - when all of the monsters that have the door tag have been killed, the camera will dramatically pan towards the door that is being opened. I say "dramatically", because I was trying to get the effect that you see in Mystical Ninja for the N64 when you kill all of the monsters in the room and get an award - the camera dramatically (dare I say, violently) pans toward the area where the item appears. The camera transition itself is not linear - it is in fact hyperbolic. [12-7-2012]_ Added some monsters this time that you shoot into smithereens. They're little stinkbugs that walk around aimlessly for now (they'll do something different later). Notice the yellow gate with the gray square on it. I got this idea from Legend of Zelda: if you kill all of the monsters with a specific tag, the shutter door will open. It's shut now because both of the green stinkbugs are tagged by the door. So, why do I have to tag the monsters? Simple... because I'm going to have more than one shutter door in a map and I can't just say "Kill all of the monsters" because some will obviously be behind other shutters - the map is just too big to do this also. In Legend of Zelda, it worked because the maps were so small. In StarTropics, the maps were equally small, but all of the monsters in a room weren't tagged in order to open a specific door. Think of the Bell Caverns: there is a room near the end of the caverns that has two behemoths in a room with spikes along the left and upper wall. If you kill both of them, you open a passageway to the east, but if you use the rod of sight, you'll find a tiny ghost and, if you kill the ghost, it opens a door to the left. This is where the idea came from - to simply tag monsters to different doors, so that, when all of the tagged monsters are defeated, the door they were tagged by opens. [12-2-2012]_ I have been negligent in updating my Quadrill 5 page (and Quadrill 5) recently, due to work, but I've had some good work put into Quadrill 5. Specifically, I spent some brainstorming time and enhanced the efficiency of my drawing subroutines. In fact, my drawing subroutine efficiency was so good that I (finally) implemented dark rooms. As you can see, in the screenshot, there is a short-range area of visibility for the player. Everything outside of the range of visibility, in the dark room, is partially obscured (see the loose block that's just barely within view due to the dark room). 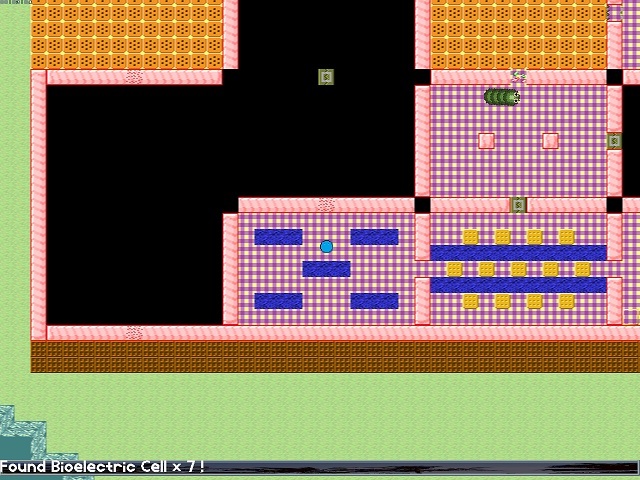 I've also implemented the breakable walls and bullets (surprisingly easy) and next will be the sentient monsters / NPCs. I've implemented the events, but this time they are all hidden by default. [1-30-2012]_ I've added quite a few things - things too numerous to display in a single screenshot, so I'll try to list them all in one small spot. I have some sprites setup - so far they are all of the non-sentient and non-moving kind for the most part. 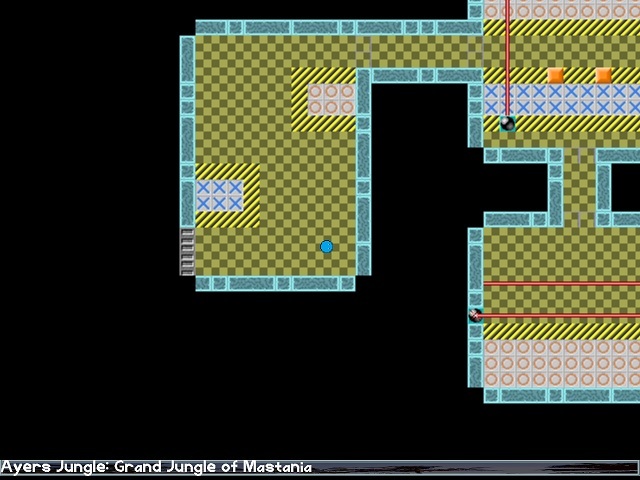 As you can see in the screenshot, I have loose blocks setup and they move based on the direction that you push them. However, this time, the loose blocks can move each other - in case you have quite a stack of them, you can push them all - assuming that they have somewhere to move. I've set up passgates - and, as you can see, they also help obscure dark areas the same way that doors do, except that passgates are sprites and doors are not. Passgates are made sprites because they can disappear and reveal a tile underneath. Doors simply open and turn into the open door version of themselves. I've setup flags so that I can implement as many doors as I can fit into the tile list. 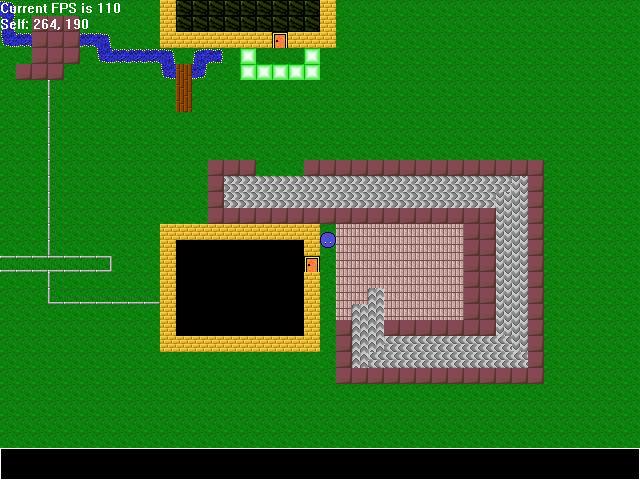 Transfer tiles take you to an overworld map and from the overworld map to smaller submaps - towns and caves and such. It is now possible to step into water (however, you cannot swim and will drown shortly after stepping in water). More on that much later, when I add more of the game in. Things to add soon - sentient monsters and bullets, breakable walls, and basically, the rest of the things from previous versions of Quadrill. It's going to be awesome! [1-1-2012]_ Updated Quadrill 5. Since I've got the new old computer up and running, I've been putting in some time towards making Quadrill 5 excellent. I've implemented electricity and currently it's used to open doors and start conveyor belts. If you look in the picture you can see the blue doors with "teeth" are shut and, if you look *really* carefully, the conveyors aren't scrolling. Once you hit the applicable switches on the left, the conveyors start rolling and/or the doors will open. I'll add more uses for electricity as time progress. Tentative uses are for lasers and the ability to lay out your own wires. I also used a compression algorithm to reduce the map file size. Previously, they used to be 169 KB per map. Now, I've compressed them down to the 8-32KB range. [9-5-2011]_ As promised, here is a quick screenshot of Quadrill 5 in the works. This is a test room that is only used for testing the new Quadrill engine. The engine itself now supports the q-ball standing in between tiles. Also, the handling of tiles is markedly different. To the player, everything should be transparent, but each tile now stores its own information about how it will interact with the player (for the most part). The big example here is that a tile decides if it is going to act as wall for the player. This will allow me to make walls that can be walked over/through. I currently have twelve tile behaviors and am currently processing the actions for each of these behaviors. All of these behaviors have existed in previous Quadrill games, with the exception of five. If you look in the picture, you'll see one of the new behaviors. The inside of the building is completely dark... but as soon as you open the door, you'll be able to look inside and see what's there.